I will admit, lasagne is not as pretty on day two. This one in particular because it has some broccoli in it and that vibrant green fades to dull army yuck after a night in the refrigerator. Still, this was a big hit at Saturday’s yoga retreat and I got multiple requests for the recipe. Lasagne is not something I make often but it is the perfect thing to make when you need to feed a lot of people. The tricky thing for me is finding a recipe that isn’t a total gut bomb. I knew these yogis would be hungry after a two hour hot yoga class (I certainly was) but no one wants to undo all that good-for-your-body yoga with a bad-for-your-body lasagne. Many lasagne recipes use a béchamel sauce (which is a cream sauce with a roux base) and while those certainly taste good, they are not the healthiest. I try to avoid that type of lasagne but what you are often left with are the boring lasagnes or the “super quick” ones that rely on lots of cheese and bottled sauce. I thought this was a really good version. The filling is quick-sautéed red bell peppers mixed with steamed broccoli and ricotta. Broccoli might sound weird in a ricotta filling but I thought it was terrific. Make no mistake. You are not going to find this dish at a wellness spa. But here is a good example of how I like to eat. There is regular ricotta, regular mozzarella, and regular Parmesan in there – I find the low fat versions of those things to be disgusting. I just used a lighter hand with the cheese. I doubled this recipe and I had way too much broccoli, so I am adjusting the recipe below. I have never had success with those no boil lasagne noodles, but I bought mine at Whole Foods this time (their brand, super inexpensive) and they became meltingly tender in the oven. The sauce here was a star. I’m a big fan of sundried tomatoes in general but had never used them in a sauce. Turns out they lend a smokiness and depth to an otherwise simple sauce. All in all, this was a wonderful dish. One I would make for gatherings big and small. I assembled the entire lasagne the day before and let it sit in the refrigerator overnight. I baked it for an additional 20 minutes or so. Put a large skillet over medium heat. Add just enough olive oil to coat the bottom and then add the peppers and a large pinch of salt. Sauté, stirring occasionally, until peppers are crisp-tender, about 7 minutes. Allow to cool slightly. Put the ricotta into a large bowl and stir in the peppers. Steam the broccoli until crisp-tender, about 3 to 5 minutes. Allow to cool slightly, then give it a rough chop. Stir into ricotta mixture and season to taste with pepper and salt. 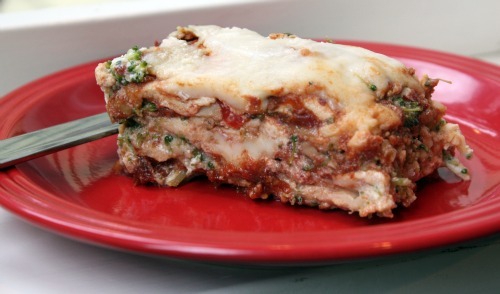 Pour 1 cup tomato sauce into a baking dish, 13 by 9 by 2 inches, and line the bottom with lasagne sheets, not overlapping. Drop about 1½ cups ricotta mixture by spoonfuls onto pasta and gently spread with back of a spoon. Sprinkle ¼ of the mozzarella and ¼ of the Parmesan over ricotta mixture. Make two more layers in the same way, beginning and ending with pasta. Spread remaining sauce over pasta (you may have a bit left over), making sure the pasta is completely covered, and sprinkle with remaining mozzarella and Parmesan. Cover dish tightly with foil, tenting slightly to prevent foil from touching top layer, and bake in the middle of the oven for 30 minutes. Remove foil and bake lasagne 10 minutes more, or until top is bubbling. Let lasagne stand 5 minutes before serving. The recipe instructs you to use a food mill to purée the sauce but I don’t have one. I used my handheld immersion blender. It was fairly chunky but I liked that. In a small bowl soak dried tomatoes in boiling water 30 minutes and drain. While tomatoes are soaking, heat a saucepan over medium-low heat. Add butter and when melted, add onion and a large pinch of salt. Once soft, about 5 minutes, add the garlic and stir another 3 minutes. Pour in the tomatoes and the sugar and another pinch of salt and cook, stirring often to break up the tomatoes, until thickened, about 30 minutes. Season to taste with salt and pepper. Use an immersion blender, a food mill, or a traditional blender to purée sauce. Oooh, Dana. I have been craving lasagne lately, and this looks wonderful! I love the addition of broccoli, too. I think I’ll have to make this, maybe on Monday night for a Valentine’s Day dinner. This sounds so good! I haven’t had lasagna in years and it’s about time I do something about it. I’ll try out this recipe and I love the sound of the broccoli mixing with the ricotta! Yum. Lasagne is always pretty to me. I may try this broccoli and red pepper version. It is my favorite casserole and I never tire of it! looks yummy! love the addition of sundried tomatoes and red peppers! My family actually never uses a bechamel in their lasagna….in fact, I’m pretty sure my parents have no idea what a bechamel even is. So it CAN be done! I really love the sound of broccoli in the ricotta filling. i’ve done broccoli rabe as a layer before but have never mixed it in with the ricotta. Delicious. thanks Dana!! I’m always looking for a good vegetarian lasagna, but not one that becomes something else (like a white lasagna). This looks like a good ole cheesy-filled regular lasagna, just without meat. I will most definitely try this the next time I’ve got a craving for some. No worries about the day 2 photos, I totally understand, and you had me at cheese! I need to take a lasagna for a dinner party soon, and might use your recipe this time, seems delicious! It still looks good to me! I love these and I am going to make them soon! It looks absolutely delicious and irresistible. I really have to buy all those ingredients as soon as possible and try the recipe at home. Thank you for sharing the recipe. I made this tonight and we all loved it – my 4 year old included! Very fresh and flavorful… nice to have a non-greasy, not so heavy lasagne recipe in my back pocket now. The sauce was a star. I didn’t have dried tomatoes so I swapped roasted peppers instead, but will definitely try the dried tomatoes next time. Thanks, Dana! First – I love your blog. I read it religiously and refer lots of people your way when they ask for recipes! I made this last night and it was easy, healthy and scrumptious! I needed closer to 5 cups of sauce to cover all of the layers, but maybe the sauce I used (homemade/canned) was chunkier than what you had? I also included chopped fresh basil and roasted garlic in the ricotta mixture. 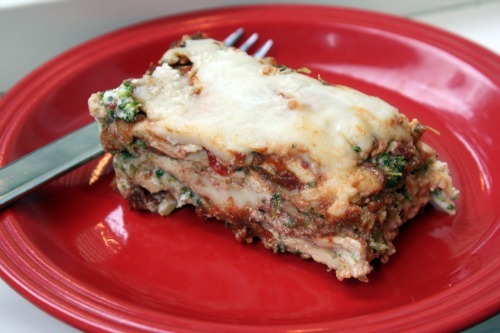 Thanks for posting a vegetable filled lasagne that is delicious, filling, and healthy! I didn’t used to like lasagna then tried a broccoli one and changed my mind, so I can definitely see the appeal of broccoli in this lasagna!